This week is the second of our two posts focusing on summertime and summer holidays in Hampshire and the Isle of Wight. The Isle of Wight, located in the English Channel off the coast of Hampshire, has been a popular holiday destinations since Victorian times. The earliest record of a ferry service, transporting people the four miles across the stretch of water known as the Solent, is from 1420 when the Lord of the Manor in Ashey [Ryde] was responsible for boats crossing between Portsmouth and Ryde. A rota of Ryde fishermen had been established by the 17th century and in 1796 a purpose built sailing boat began a regular service from Portsmouth. 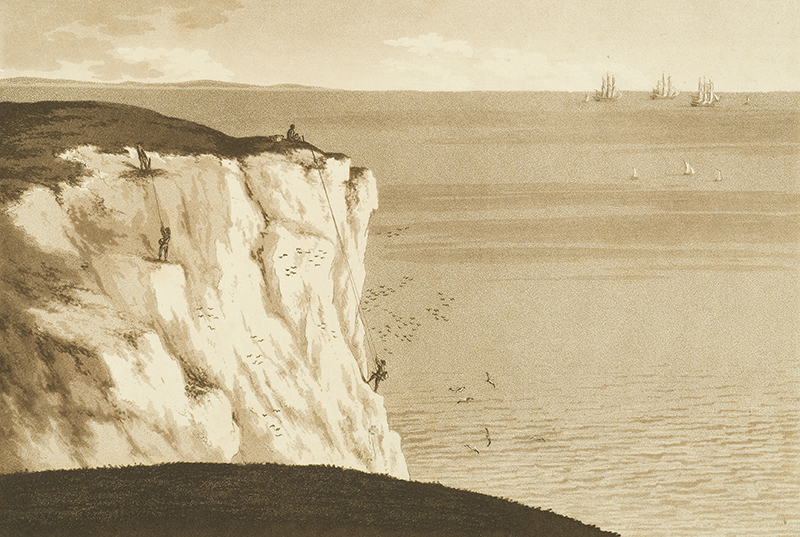 The Special Collections holds a manuscript “journal of seven weeks’ peregrinations at the most beautiful place on earth, namely the Isle of Wight”. It was written by Sarah Jane Gilham and dates from 1850. Prior to the completion of Ryde Pier in 1814, passengers were carried or transported by horse or cart across the wide shallow sands to the town. By 1850, Sarah Jane would have had the option of travelling to the island by paddle steamer on one of three routes: Portsmouth-Ryde; Southampton-Cowes or Lymington-Yarmouth. [f.64] After walking up a hill, at a short distance on stood the little church, the smallest in England. The outside is covered with ivy, in a small turret is the bell which summons the villagers to church. An aged man showed us the inside: it contains six pews, and an altar piece with a colored pane of glass representing Christ’s ascension. It has lately been enlarged as formerly it contained only three pews. We remounted and as we advanced every thing seemed to grow lovelier. Steephill Castle rose to view and its white turrets contrasted very prettily with the dark and luxuriant foliage of the trees by which it was surrounded. At last we arrived at the head of the Chine; dismounting, we passed through the bazaar and two boys conducted us down the path to the foot of the Chine. 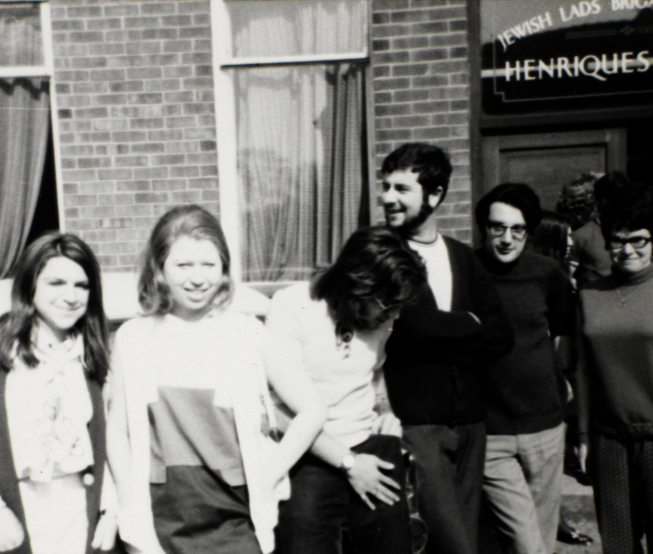 [f.65] At the first sight I and most of us were disappointed. We had expected a rush of water, but it fell only in a trickling stream somewhat resembling a showerbath. Some stationed themselves on the beautiful shingle, and others endeavored to find a cool place beneath the shelter of the rocks. 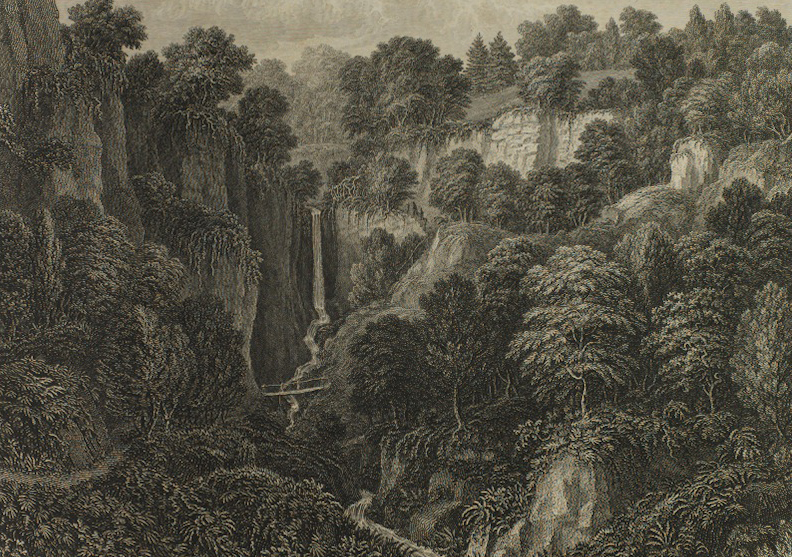 On nearer view the Chine is decidedly grand, the fall about one hundred feet, the rocks rise on each side in bold grandeur, and though somewhat barren are quite in character with the scene. It seems altogether a place for a storm and shipwreck, etc. It would then be seen in all its awful grandeur and the spectator would be unable to resist admiring, though his admiration would be mingled with feelings of a very opposite nature. In its quiet passages this work takes on a contemplative quality, reflecting the journey of religious self-examination Miss Gilham was taking alongside the journey around the Isle of Wight. It was not, however, written as a private journal for the sole pleasure of its author. This is a fair copy to be circulated and shared with others, as it glories in the discoveries made, both in terms of religion and places visited. Indeed, in its wish to discover nature and the way in which it makes this an ‘ideal’ landscape, the journal bears the hallmarks of picturesque tourism. While the scale of the adventure and the daily events are perhaps small, this in no way impacts on the curiosity of spirit or keenness of eye cast upon thoughts, places and events. Sarah Jane married a London solicitor John Matthews Chamberlain in Lewisham in 1857. They had two daughters: Bertha in 1861 and Ada in 1863. Sarah died a year after the birth of their second daughter. This week we are publishing the first of two posts focusing on summertime in Hampshire and the Isle of Wight. A century ago, a summer stroll along the waterfront provided a welcome relief from the crowded streets of the old town for Southampton’s residents and visitors. The attractions of the area were recorded by local photographers and many of the views are preserved in the Peter Cook Postcard Collection. 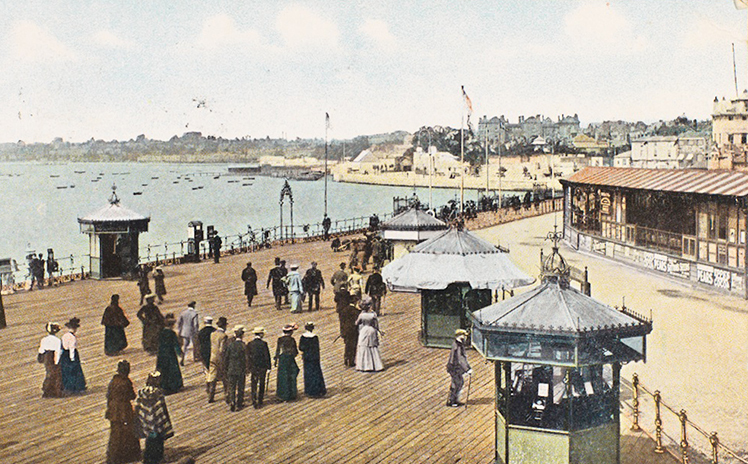 According to 19th century guidebooks, a promenade along the pier had long been a favourite pastime. Opened by the Duchess of Kent and Princess Victoria in July 1833, the original pier had a central carriage-way and footways on either side. Intended primarily as a landing stage for ferry and pleasure steamer passengers — the pier having been built largely as the result of pressure from the steamship proprietors — it went on to acquire some of the attractions associated with a traditional seaside pier. 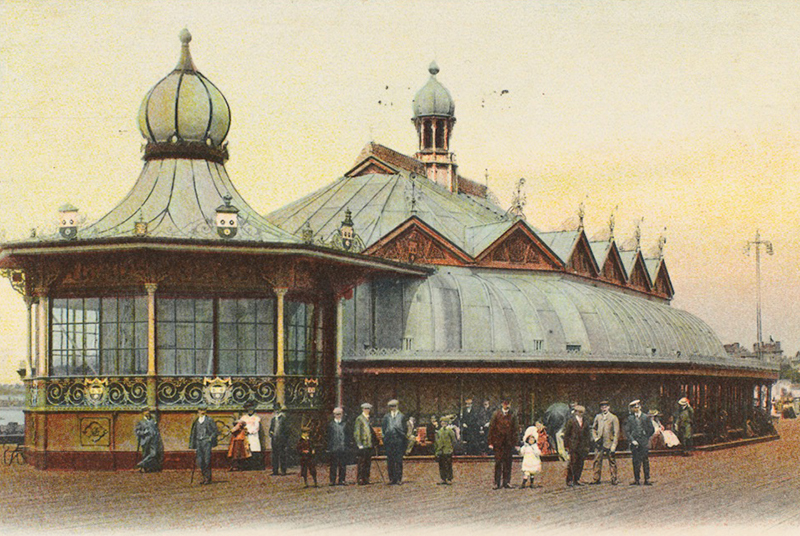 The rebuilding of the pier in the 1890s brought a new gatehouse, refreshment rooms and a bandstand which was soon altered to create a pavilion which could accommodate over 1,000 people. The pier extended to an area of four and a half acres and with its 10 berths for steamers providing ferry services or excursions to the Isle of Wight, along the coast and across the Channel, the Royal Pier was the largest steamer or pleasure pier on the south coast. 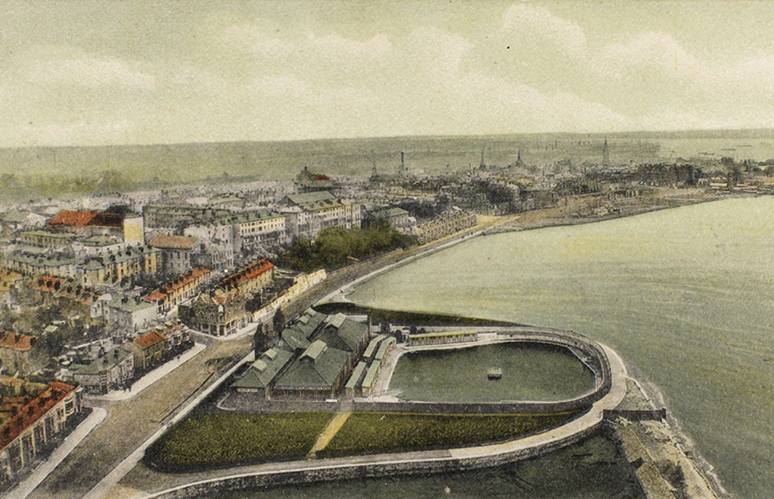 In the early years of the 20th century it was possible to walk from the pier along the new Western Esplanade which followed the shoreline to another of the town’s summer attractions, the open air pool. This had also been built during the 1890s as part of a new baths complex and the outdoor pool, which covered half an acre, had been built out from the shore as a seawater pool, the water changing at every high tide. Beside the baths there were pleasure grounds laid out for tennis or bowls. The pool underwent many refits, most notably in the 1930s when new terraces and dressing rooms were added and it remained popular even when it became landlocked, following the land reclamation work of the 1920s and 30s which left it sandwiched between the Pirelli cable works and the coal fired power station. The Royal Pier and Lido both met their ends in the 1970s. The introduction of car ferries meant that ferry services moved away from the pier in the 1960s and although Mecca invested £100,000 in a ballroom at the pavilion in 1963, its popularity eventually declined and both pier and pavilion closed in 1979. Fires in 1987 and 1992 destroyed most of the remaining structure. The hot summer of 1976 had brought a record number of people to the Lido, but the high costs of maintenance led the City Council to close it in 1977. The buildings were demolished in 1981 and the pool, now the site of the National Express coach station, was filled in with local builders’ rubble. On 28 July 1945, the Japanese were delivered an ultimatum to surrender. It was not until mid-August, however, following the bombing of Hiroshima and Nagasaki and the invasion of Manchuria by Soviet forces, that this was agreed. 15 August was celebrated as victory over Japan day with a two-day holiday declared in the United Kingdom, the United States of America and Australia. While 15 August was celebrated as VJ day, it was not until 2 September that the Japanese administration, under General Koiso Kuniaki, signed a formal surrender document. This document was signed in the presence of General MacArthur, the Supreme Commander of Allied Forces, on board USS Missouri. 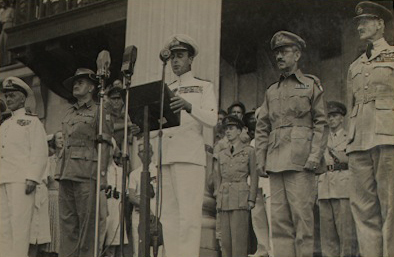 Two weeks later, on 12 September, another Japanese surrender ceremony was held at the Municipal Building of Singapore, officially ending the Japanese occupation of South East Asia. This formal surrender was accepted by Lord Louis Mountbatten, Supreme Allied Commander, South East Asia.